Holiday season commuters will have to get used to not seeing the lavishly decorated Christmas tree in Larry and Pat Fortier’s yard on Route 12 in Hartland after many years. The Fortiers’ son Kevin planted the tree 30 years ago, but it’s now proudly standing in front of the State House in Montpelier. Kevin’s father said they put four feet of the tree into the ground and secure it with concrete. 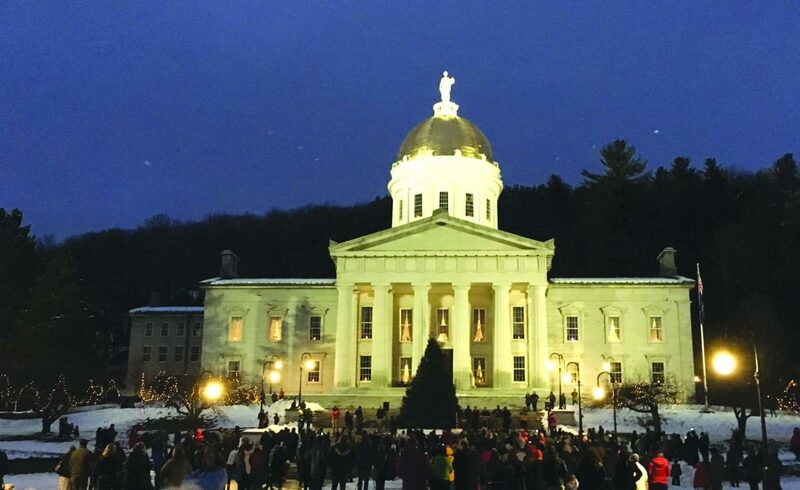 Larry and Pat Fortier attended a recent lighting ceremony in Montpelier. Just before that, a contractor from Waterbury cut the tree down and trucked it to the capitol. According to Chris Cole, Vermont’s commissioner of Buildings, Grounds and Services, the tree, which is 30 feet tall, will remain decorated and in place until sometime in January. Gov. Phil Scott’s lighting of the tree coincided with installation of the replacement figure of Ceres, the Roman goddess of agriculture and mother-child relationships, sculpted and designed by Vermont artists and installed on the State House dome. Ceres and Christmas trees share ties to ancient seasonal traditions. Pagans brought evergreens into their homes for thousands of years – during dark, cold winter months the bright greens retained a spirit of life. Christianity emulated many pagan traditions – even Christ’s birthdate was moved to match the pagan Winter Solstice celebration. Ceres’s daughter Proserpine was taken to the underworld by Pluto as his bride, which broke Ceres’s heart. She rescued Proserpine, but only for spring and summer – Proserpine returned to the underworld every winter. In myth, the cycle of darkness and death in winter, and birth, growth and fertility in spring, coincided with Proserpine’s annual banishment and return. Christmas trees appeared in the 16th century in Western Germany, decorated with gingerbread, nuts and apples. Wealthier folks decorated with gold leaf, paper decorations, and candles. Americans shunned Christmas trees until English Queen Victoria was depicted decorating the Royal Tree in a popular poster in the nineteenth century. A powerful electric power lobby convinced President Calvin Coolidge to bring a tree to the White House from Vermont in 1923. It has been a national celebration since. According to State Curator David Schultz, Vermont has had a state tree for more than 60 years. Schultz and head groundskeeper Ira Moser have chosen the tree from among submissions, like Fortier’s, which included photos and a narrative. Fortier has a new tree, about seven to eight feet tall, ready to plant for future local commuters’ enjoyment. A 2,000-pound tree from Hartland was selected for the State House lawn in Montpelier.